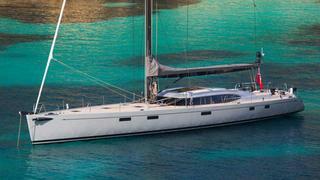 Simon Turner at Northrop & Johnson in Spain sends word of a further €300,000 price reduction on his joint listing for sale with Berthon International, the 24 metre sailing yacht Paula Rosa. Paula Rosa was built by UK yard Seaway to a design by J & J Design as one of the Shipman 80 series and delivered in 2008 with a comprehensive refit in 2011/2012. The refit included a new paint job, a new generator and an updated navigation system. In 2013 her PBO rigging was updated and her keel and rudder were serviced in 2014. A light and airy interior by Rhoades Young Design accommodates six guests in a master suite, double and twin cabin, all with en suite facilities. Large sliding windows at the rear of the saloon and generous steps connect the interior and exterior areas. Under power, a 240hp Yanmar engine gives her a range of 1,400 nautical miles at nine knots. Lying in Palma de Mallorca, Spain, Paula Rosa is down from €2,750,000 to €2,450,000.